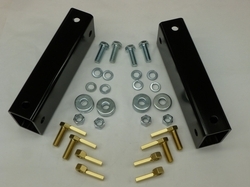 For any trailer that uses Dexter #9 bolt-on axles. Also fits Dexter #8 bolt-on axles. One kit needed per axle. Contact us for any trailer not listed below. This kit will lift your trailer body 3" above the normal axle install height for increased ground clearance. The kit is made from full tube, rather than open C-channel and is therefore very stout. We weld tabs onto the supplied grade 5 fine-thread nuts/bolts so no tools are needed inside the tube to tighten. Included are installation instructions to help you install the kit easily. Please check out the installation instructions to get a feel for the scope of work involved contact us for any questions.